Nancy Hanson’s corner lot yard has been covered in yellow, orange and brown leaves for weeks. Everyday the piles just keep getting bigger and bigger, but Hanson cannot rake them. A few years ago, she broke her hip and since then has not been able to do simple chores outside. On Saturday, 20 students from the Marquette University High School Key Club, 3401 W. Wisconsin Ave., came to her house to help. “I think it is just fantastic and so unexpected. I don’t know how I would rake the leaves without them,” Hanson said. The students were volunteering for Milwaukee’s Make a Difference Day, where more than 1,300 volunteers helped winterize approximately 300 senior citizens’ homes. The event was a collaborative effort between the Volunteer Center of Great Milwaukee and the Interfaith Older Adult Program. Nichole Mittelstaedt has been volunteering at the event for five years with her three daughters: Bella, 7, and twins Savannah and Sadie, 6. Over the years, the Mittelstaedts have raked leaves, washed windows, removed screens, put up storm windows and cleaned gardens during the event. 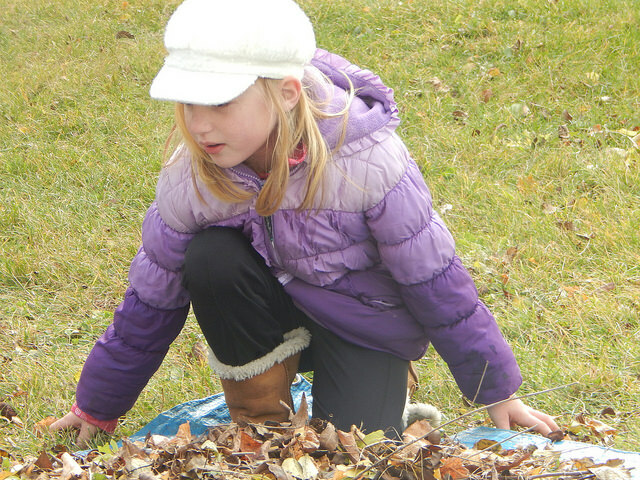 For the girls, raking leaves and jumping into the piles is the most fun. “We want to teach our girls at a young age how important supporting the community is,” Mittelstaedt said. While the event’s goal is to winterize older adults’ properties, many volunteers, including Mittelstaedt and Mbogne Ba, have found that sometimes the seniors simply want to talk. “My favorite story was when we went to one house and she had made us cookies. I told her we had to work but she was just interested in talking to us,” Ba said. Ba has been volunteering with Make a Difference for five years. After her first year she decided to bring members of MA’RUF, a Muslim organization she belongs to that advocates for social justice. This year 30 members volunteered. Other volunteers include community members, employees at local companies, families and student groups from University of Wisconsin Milwaukee and Marquette University. Mardi Charnitz, neighborhood outreach director at Interfaith, agrees that many of the seniors want people to talk to. She said that one-third of all older adults live alone. For Hanson, that time came a few years ago. Make a Difference Day helps her remain independent in a house she has lived in for nearly 45 years. “This has certainly made a difference to me and I’m sure it makes a difference to other people too,” Hanson said.